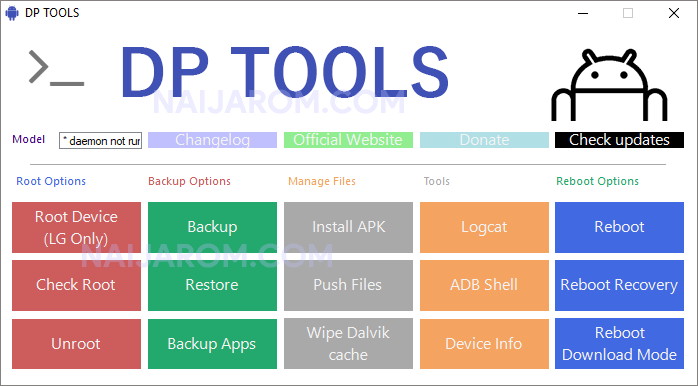 DP Tools is a small application for windows computer which allows you to Root the LG Smartphone and Tablets, Check the Root Status of the Device, Unroot the device in single click only. It also allows you to make or generate the complete backup of your LG Smartphone and Tablets. You can restore the Complete backup anytime. It also allows you to make the backup of installed Apps. It also allows you to install any APK application on the device, Push any APK application from the device to the computer, Wipe the Dalvik Cache Data from the device. It also allows you to see the complete Log of the device, Boot the device into the ADB shell Mode, Generate or get the complete info of the device. It allows you to quickly reboot the device, reboot the device into the recovery mode, reboot the device into the download mode. In order to use the DP Tool properly, you need to install the Universal ADB Driver on your Computer. Once Driver is installed you can successfully connect your LG Device to the computer, and launch the DP Tool on the computer. [*] Credits: DP Tools is created and distributed by DP Team (developer). So, full credits goes to DP Team (developer) for sharing the tool for free.